If you are considering a food dehydrator but aren’t sure where to start, Upland Hunter has your back with our top 10 food dehydrators of 2018. Dehydration is a safe, cheap, and easy way to preserve food. It can be pretty darn fun to do too, once you get the hang of it. What’s more, dehydrated food is more nutritious per ounce and takes up way less space than other foods. You can basically dehydrate any type of food; herbs, plants, nuts, fruits, vegetables, fish, and meat are all dehydratable goodies. Wild game is a particularly prized type of food to dehydrate, especially when gathered in large amounts. An excellent dehydration job leads to delicious and long-lasting jerky, which is a neat way to spice up (sometimes quite literally) the way you enjoy your wild game all throughout the year. Previously, traditional methods for dehydrating food either took way too long or demand a ton of work, such as in the case of air drying. With the aid of new technology, however, food dehydration is now a cinch and requires little more work than placing food on a rack. As with more or less every product these days, the assortment of machine-operated food dehydrators is vast and sometimes even intimidating. Taking into account just how much some of these dehydrators can cost, it’s worth taking a deeper look at what these gadgets are really offering you. The good news is that most dehydrators do what they are designed to do. So the trick with choosing the right one is thinking about your needs: How often will you be dehydrating food? How much space do you have available for the machine? Are loud processing noises going to be a problem for you? 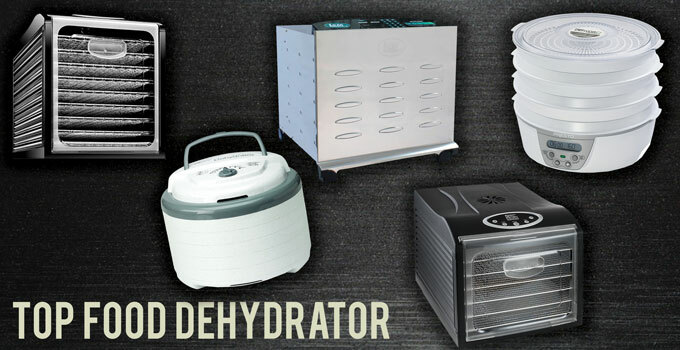 Below, we review 10 of the top options for sale today and giving you an inside peek on a variety of food dehydrators. Take a look as we whittle the options down to our final selection for best food dehydrator. The newest model of the Nesco Snackmaster Pro food dehydrator series boasts 600 watts of drying power that, in line with Nesco’s patented Converga-Flow drying technology, helps dry food in a matter of hours. The drying system funnels air down a pressurized chamber while hot air simultaneously flows across individual trays for a rapid drying – eliminating the need to rotate trays. In addition to the ease of use, its sleek contemporary design comes in either grey or marble colors that not only keeps your kitchen looking spiffy, but also conserves plenty of counter-top space. The dehydrator reviews are spectacular overall, and most purchasers praise the machine’s capacity to dehydrate all kinds of foods, from beef to apples, without mixing flavors. 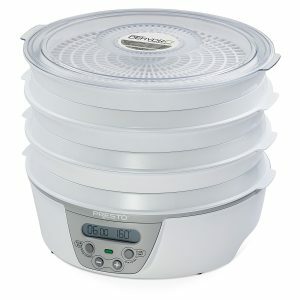 Beyond its unique drying mechanism, this food dehydrator offers an adjustable thermostat (ranging from 95º to 160º F) that provides you with the flexibility of drying foods at appropriate temperatures. The opaque Vita-Save exterior additionally helps block harmful light from destroying the nutritional content of food inside the machine. This premium food dehydrator uses Circus Mart 360 Air Flow Circulation technology to dry food quietly and equally inside its spacious interior. The six wide, height-adjustable shelves enable you to dehydrate food of varying sizes at 400 watts of power. The glowing reviews of the Gourmia GFD1650 emphasize its multi-pronged control features â€” allowing for precise drying time and temperature. With eight preset temperature settings, you can choose temperatures from 95º to 158º F. The built-in countdown timer further lets you dry for up to 19.5 hours in 30-minute increments. This dehydrator is a solid option going at a mid-range price that can dehydrate a wide range of foods including meat, fish, poultry, fruits, vegetables, herbs and spices, and nuts. This electric food dehydrator comes equipped with a bottom-mounted fan and heating element that together provide consistent airflow for effective drying, without needing to rotate shelves. A digital thermostat, along with a timer, gives you accurate drying temperatures (from 90º to 165º F). This dehydrator has gotten great reviews with customers mentioning the ease of use and the low level of sound it produces. The six-tray system is commercially available at a relatively low price, and gives you the freedom to dehydrate a string of different types of foods all at the same time. You can remove each drying tray to give the machine nearly 40% additional storage space. The Presto 06310 is also fitted with a transparent cover on the top tray that lets you watch over the drying process. And the drying trays and cover are safe to wash in the dishwasher. A notable downside of this dehydrator is its large size and weight. a fixed temperature, without needing to rotate trays. The automated system is perfect for beginners, who can start drying foods with the flip of a switch. You can add seven drying trays at a time (or more), which amounts to seven square feet of drying space and yields roughly seven pounds of jerky. The top also detaches for easy-access cleaning. Intended to make jerky-making as simple as possible, the Jerky Xpress provides everything you need to prepare homemade jerky apart from the ground meat itself. Measuring 14 by 14 by 9 inches and weighing only 5.5 pounds, the dehydrator is compact and portable. The majority of reviews are excellent, though a few reviewers have complained about the low quality of the plastic material causing the trays to sag. The affordable cost and free one-year limited warranty make Nesco’s Jerky Xpress one of the best dehydrators for jerky around. 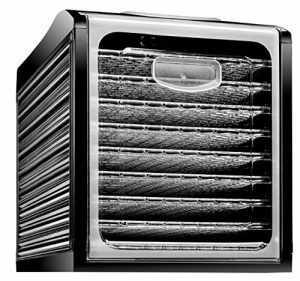 The 400-watt food dehydrator from Magic Mill is loaded with a rear-mounted fan that distributes heat using airflow circulation technology. Its standout feature is the stainless steel material it’s made up of, which results in an extended shelf-life compared to more common plastic dehydrators. This food dehydrator has received countless positive reviews raving that this is an excellent dehydrator at a great value. A see-through cover, automatic shut-off, and the built-in drip tray make dehydrating with the Magic Mill Pro extra convenient. On top of those perks, the device includes overheating safety protection as well as a one-year limited warranty that turn it into a safe, albeit expensive, option for small-scale DIY food dehydration. 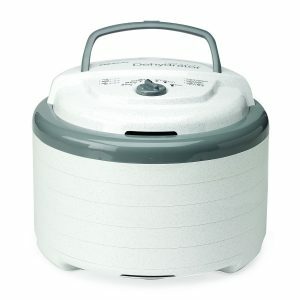 This food dehydrator makes the dehydration process simple while still being a versatile machine for the money. With Electrical Testing Laboratories (ETL) approval, the Chefman is certified as safe and durable. A few minor drawbacks are that it takes up a considerable amount of kitchen space, it is limited to five options for temperature settings, and the rear-mounted fan occasionally pushes the drying trays forward against the front panel. All things considered, the Chefman is a solid choice for medium-scale food dehydration. It is not the most powerful or fanciest dehydrator, but is affordable compared to other machines of a similar size. Offering up to 15 square feet of total drying space, the Excalibur 3926TB is arguably one of the best alternatives for large-scale food dehydration due to its substantial size and powerful back-mounted heating system. The fan, heating element, and thermostat sit in the back of the unit so that cool air is pulled in, heated, and then dispersed evenly over each drying tray. 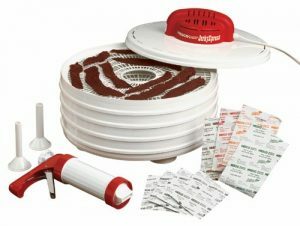 This dehydrator can hold significantly more food than most other dehydrators on the market. This alone, was a top reason for us to give it high marks. When you have a lot of meat or other food to dehydrate, its nice to get it done in one or two sessions rather than have it last much longer. The Excalibur 3926TB food dehydrator is widely praised for its high-quality machinery. It isn’t necessarily the biggest or baddest of dehydrators, but the company has a great rep among the dehydrating community. Important to note are its enormous size and lack of transparent door for viewing throughout the drying process. The STX International Dehydra 600-watt model is a large food dehydrator that functions well but brings a few kinks along with it. With its stainless steel trays, wide-ranging temperature control, and lengthy 40-hour timer, this dehydrator has potential to rank among the top food dehydrators. Although it has received some great reviews, we have noticed that it doesn’t quite compare to the other dehydrators at the top of the list. One area of concern we noted was that the quality of assembly could use some improvement. The door tends to rattle during operating which could get irritating for some users. Despite its superb individual features, the STX International Dehydra 600-watt model is plagued by a few minor setbacks that have resulted in its somewhat mixed reviews. A few users have complained of excess jerky liquid leaking out from the machine. Others have repeatedly mentioned the flimsiness of the hingeless front door: Although heat-retentive, the door occasionally rattles and produces unwanted noise. A recent upside is that the original price has been slashed by nearly half – converting its former status as one of the most expensive dehydrators to a relatively affordable one compared to others of the same size. Blazing at 1200 watts of drying power, the STX International Dehydra 1200-watt model is a contender for the strongest food dehydrator. 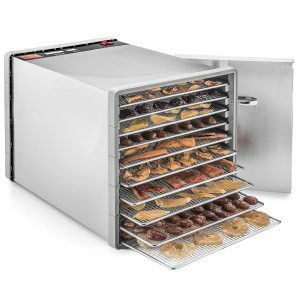 The extra-large commercial food and jerky dehydrator boasts racks and drip pan that are not chrome-plated but actually composed of 100% stainless steel. This all stainless steel dehydrator is unmatched in quality and productivity. Of course quality always comes with a higher price tag to match, but you can expect to get what you pay for with this unit. This highly praised food dehydrator seems to have it all. For starters, it has an extremely powerful dehydrating system including a seven-inch fan. The control panel is entirely digital and offers a variable thermostat reaching up to 165º F. The drying trays are made of solid, non-rust, non-warp material. And it has a special split-apart unit that allows you to take the machine apart in seconds for easy cleaning. The STX International Dehydra 1200-watt model is a large dehydrator that can work well for years when properly taken care of. 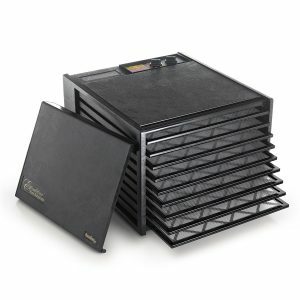 One of the most expensive personal dehydrators available, the LEM Products 1154 food dehydrator gives you 16 square feet of drying area on 10 stainless steel drying trays. It hosts a top-notch digital settings setup that includes three customizable preset temperature controls from 90º to 155º F as well as an automated timer. 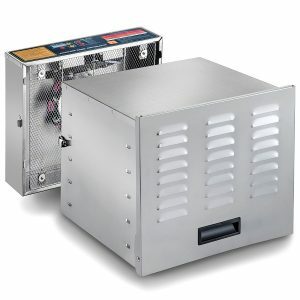 The rear-mounted fan of the LEM Products 1154 dehydrator heats food with 770 watts of power. Also, the sliding door allows you to examine or take out trays on the lower level with minimal heat loss. Moreover, the “whisper quiet” fan lets you enjoy dehydrating without bothering others. Its enormous size and high cost require a serious investment, but most reviewers are impressed by the ease of its digital operating system and professional design. So how do you choose which dehydrator is right for you? Well, food dehydrator reviews depend on numerous details. Among which a handful of major factors seem to hold the most weight. These factors not only play a role in how well the dehydrators perform their job, but also how long they might last and how convenient it may be to use them. The type of heating system a food dehydrator employs may be the most pivotal determinant of its quality. 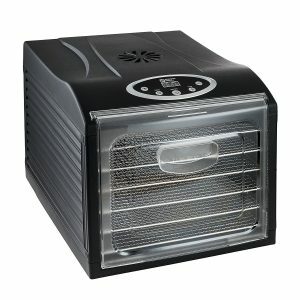 Food dehydrators generally have their heating fan in a few different spots. A rear-mounted heating fan sends hot air from the back of the machine toward the front. The primary advantage of this fan placement is that different foods sitting on trays at all levels receive their fair share of heat. Unfortunately, many dehydrators with rear-mounted fans require you to take each tray out and rotate it halfway through the dehydration process to make sure the food is evenly heated. Top-mounted heating fans often dehydrate food more evenly based on how close the tray is to the fan. So all of the food on the top tray might receive a certain amount of heat, and all of the food on the bottom might get slightly less heat. Bottom-mounted heating fans are rare. In addition to fan placement, the type of air flow technology used by a dehydrator affects how it dehydrates food. Smaller and newer dehydrators rely on 360º air circulation systems that are designed to provide an equal amount and temperature of heat. Older back-mounted fans are often limited by horizontal air flow. A neat feature of newer top-mounted fans is that they use an exterior pressurized chamber to send heat both horizontally and vertically at the same time. Different types of food require distinct temperatures for optimal dehydration. Fruits and vegetables, for example, tend to lose moisture relatively rapidly and are best dehydrated at lower temperatures around 135º F. Unlike produce, meat necessitates temperatures approaching 165º F.
The higher temperature a dehydrator can reach, the shorter the amount of time you will probably spend pre-heating the machine. Since the focus at the Upland Hunter is on wild game (which in the universe of dehydration means jerky), we tend to favor dehydrators that hit those high temperatures. Meat and beef jerky can turn out tasting like nothing more than overcooked steak when not dehydrated properly. Despite performing the same task, dehydrators come in different sizes. Larger machines may be more ideal for consumers of wild game due to the large quantities of meat that need to be dehydrated – depending, of course, on how well the hunt goes. Stainless steel drying trays complement larger dehydrators for their added durability. The structural makeup of a dehydrator can be hugely important for you if you plan on dehydrating often and in your own home. Some dehydrators can create a lot of noise, while others can be more quiet than the swishing of a low-sound dishwater. Moreover, a few of the dehydrators have transparent doors that let you check on the progress of your drying without having to open everything up. Most new dehydrators now run a fully digital control panel replete with pre-set temperatures and timers. A few of the more advanced models also have built-in shut-off clocks that stop by themselves when dehydration is complete. 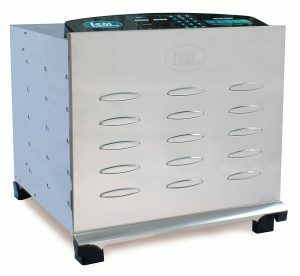 Practically all of the drying trays are safe to wash, but only a couple of dehydrators have detachable heating units to simply clean post-dehydration. First, it’s best to dehydrate the same food groups in one batch, even though the product description of many dehydrators claims otherwise. The airflow technology is still not good enough to distribute heat at exact temperatures for individual floors within the dehydrators. For even dehydration, cut or slice foods as evenly as possible. Also, don’t overlap foods. Different foods require different temperatures for optimal dehydration, so make sure to get the appropriate temperatures down to a tee. You can dehydrate basically anything. Proper storage is very important for dehydrated foods. Check out our review of best vacuum sealers for a great way to stockpile dehydrated food. Amazon’s choice as the top recommended commercial dehydrator, the extra large STX International Dehydra 1200W-XLS wields a whopping 1200-watt back-mounted fan, nearly doubling the maximum drying capacity of most other dehydrators. Thorough and evenly spread heating is the name of the game as far as dehydrators go. This behemoth takes the cake in that category. The durability of its stainless steel drying trays and drip pan, combined with its sturdy base, guarantee a long lifespan that makes its high price worth every penny. Moreover, the fully digital control panel including a variable thermostat enable you to choose the ideal temperature for dehydrating different kinds of food. To top it all off, the heating unit is detachable, which makes cleaning it that much easier. Honorable mention for best food dehydrator goes to the Nesco FD-75A Snackmaster Pro. 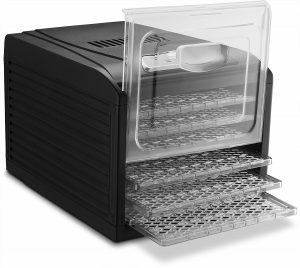 This smaller, more cost-effective dehydrator involves a patented air flow system that heats food evenly through an exterior pressurized chamber. Add to that a stylish look, and this miniature food dehydrator may just be the best bang for your buck. It’s no wonder the Nesco FD-75A Snackmaster Pro is listed as Amazon’s number one best-selling food dehydrator.